"That looks like a rainbow on the ground," Bonnie gasped. "It’s so colorful. I see flowers of every color imaginable. Where are we?" Bruce looked down. "We’re flying over a place called Flowerdale. It’s just on the outskirts of a town called Gairloch. Would you like to stop there and taste some of those flowers?" Bruce smiled, already knowing the answer. "Oh, could we? I mean, look at them. I see daisies and violets, wild roses, buttercups, hyacinth, iris, pansies, lilacs, rhododendron and so many more. It’s like being in flower heaven," Bonnie sighed peacefully. "Follow me," Bruce said and the two butterflies glided down to Flowerdale. Bonnie headed straight for the pansies. Bruce fluttered to the wild roses. They sipped nectar until they were full, going from flower to flower. "The river is beautiful. Surely it’s filled with salmon and trout. I guess people come here to fish, don’t they?" Bonnie asked. "They come here to fish, to hunt, to golf, to hike or to go on sea excursions to watch dolphins, porpoise and seals. Gairloch is an interesting place," Bruce said, while standing on the edge of a poppy. "Let’s hear it. I know you’re dying to tell me. I’m ready. Tell me about Gairloch," Bonnie said, knowing she couldn’t stop him. "If you insist. Gairloch has a history that goes way back to the Bronze Age. There are hut circles near the rivers and ruins of an ancient fort, called An Dun. There were a lot of problems with Viking invaders. You can tell because of the place names, but of course, the Gaelic influence is strong here. Gairloch actually means ‘short loch’ in Gaelic. It used to be a thriving fishing port, but now has just a few boats left, like many of the fishing villages in Scotland that we’ve seen so far." Bonnie stood and listened, nodding her head now and then, pretending to listen, but her mind was actually on the poppy that Bruce was standing on. She craved its nectar. "Yes, Bruce, go on," she said, wanting him to finish. "There’s not much else to tell. There are beaches and gardens and of course, this beautiful glen, Flowerdale and oh yes, the sunsets here are spectacular. Should we stay and watch one tonight?" he asked. "That would be lovely. I’ve not seen a pretty sunset for a long time, but for now, could you move. I want that poppy," Bonnie said, flying over to it and practically knocking Bruce off. "Bonnie, you shouldn’t still be hungry! You’ve been feasting on nectar for an hour or two," Bruce said, but she wasn’t listening. Her proboscis was deep into the poppy center by now and all her mind was focused on its delicious tasting nectar. When she finished she lay back and patted her tummy. It was full and bulging. "I’ve not eaten that much in my life. I feel too full to fly. I ate too much," she moaned. Just then a huge bee, bigger than either butterfly had ever seen, buzzed over to them and hovered above the poppy. "You’re big," Bruce gulped, looking up at it. "You’re the biggest bee I’ve ever seen," Bonnie added. "I suppose if I lived in a place called Flowerdale and could have all these flowers around me, I’d soon be big too," she chuckled, patting her fat tummy. The bee stared at them and didn’t say a word. "What do you want?" Bruce asked. The bee started buzzing in Gaelic. "What’s he saying?" Bonnie asked. "I don’t know. I can’t speak Gaelic," Bruce answered. The bee moved in closer and closer to the flower. "Uh, I think he wants us to move. I think he wants the poppy now," Bonnie said, climbing to the edge of the petal. Bruce flew a few inches away but Bonnie was so full that she couldn’t fly. The bee came closer, and closer, and closer. Bonnie climbed over the edge of the red poppy and held onto one of the petals with her hands. 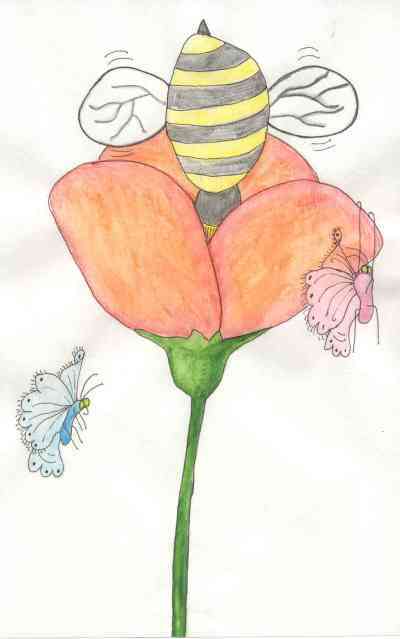 Suddenly the bee jumped up and down on the petals and her hands couldn’t hold any longer. "I’m slipping," she shouted and then had no choice but to let go. She fell through the air. "Help me, Bruce!" she shouted. Bruce fluttered down, trying to catch her but she was falling too fast. With a thud, Bonnie landed on the grass, near the poppy stem. "Bonnie! Are you all right?" Bruce asked, landing near her. She lay still and silent. Bruce nudged her, "Bonnie! Bonnie!" Her eyes opened up and she stared at Bruce. "I’m all right, but I ache everywhere." "That was quite a fall. I think you’re full tummy helped. You bounced right off it!" Bruce said, smiling at her. She sat up and rubbed her head. "That bee really wanted the poppy, didn’t he?" "We could go into town now," Bruce suggested. "The bee won’t bother us there." "We’ll have to walk for a while. There’s no way I can fly right now," Bonnie said. The butterflies walked slowly, through the tall grass, around the river, and into town. They arrived just as the sun was beginning to set. They were tired too. "Oh look, a sunflower," Bruce said. He flew up and checked for bees. "No bees here," he called down. Bonnie flapped her wings and was able to flutter up to the sunflower. "We can lie here for the night and watch the sunset," Bruce said. As the reddish-orange ball of sunshine began to set, the sky lit up like it was on fire. Rays of gold shot out through a sky of pink, purple, crimson, orange and deep blue. "It’s beautiful," Bonnie said. They watched until the sun had disappeared and darkness blanketed Gairloch. "If you don’t mind, I’d like to just curl up and go to sleep. That was quite a day." Bruce watched Bonnie pull her wings around her body and fall asleep. He stared one more time at the horizon and did the same thing. It was an end to a beautiful day.